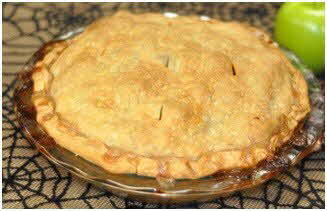 A delicious apple pie recipe, easy-to-prepare and perfect for family/friend gatherings and barbecues. 1.Pre-heat oven at 350° for 10 minutes. 2.In a medium size bowl mix all ingredients except the pie crust. 3.Place the pie crust at the bottom of the pot tag it nice and firmly begin filling in with the mixture. 4.Cover with the additional pie crust and fold edges of both pie crusts as to seal it. 5.Make four small cuts with the tip of a knife about an inch and bake in oven for about 45 minutes.